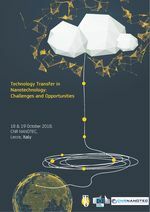 JRC in collaboration with the National Research Council (CNR) is organising a workshop on Technology Transfer in Nanotechnology,which will take place in CNR Nanotec (Lecce, Italy) on 18 and 19 October. This workshop is organised in the framework of the TTO-CIRCLE initiatives with the aim to explore how technology transfer activities can be used as a mechanism to help EU industry, particularly Start-ups and SMEs, and Government in deploying and adopting Nano-technology. More information at the link: european-tto-circle.